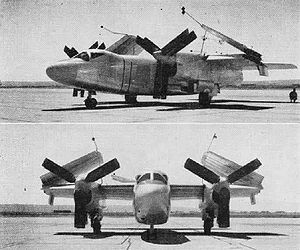 The North American Aviation XA2J "Super Savage" was a prototype carrier-based attack aircraft built in the early 1950s developed from the smaller AJ Savage. The XA2J was intended to replace the AJ Savage which was deficient in performance and was a less than satisfactory carrier plane. It was essentially an 'enlarged' AJ Savage with the two reciprocating engines replaced with two Allison T40 turboprop engines and removal of the tail-mounted turbojet. Construction of two prototypes started 1 October 1948. but due to delays developing the engines, the first flight was not until 4 January 1952. The competing XA3D, the prototypes of which were ordered the year after construction had begun on the XA2J prototypes, first flew in October 1952. The A3D had far superior performance, and that doomed the XA2J. The root cause for the failure of the XA2J was the protracted development and poor reliability of the Allison T40 engines. The T40 engine was an advanced engine design of joining two T38 turboprop engines to drive two large contra-rotating propellers through a combining gearbox, proved to be very unreliable. The T40 engine was also used in the developmental A2D Skyshark, and the XF-84H Thunderscreech. After a number of engine related mishaps the XA2J project was abandoned.